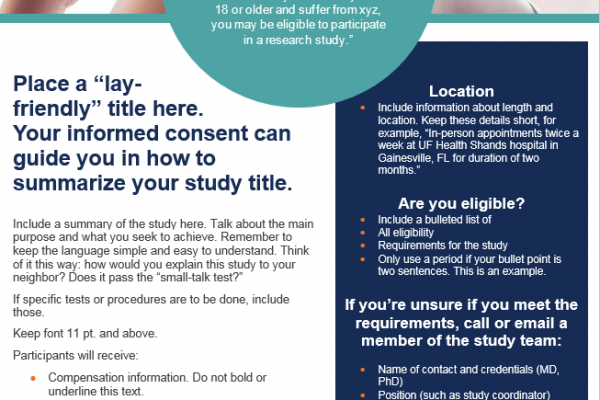 UF researchers may use these templates to create flyers to recruit study participants. Research teams may post recruitment flyers after receiving approval from the IRB. The IRB stamp of approval must be displayed on the flyer. The CTSI provides flyer templates and best practices for research teams to quickly produce attractive recruitment flyers in compliance with UF and UF Health brand standards and principles of effective design. Read about best practices before creating your flyer. Then, simply download the template, add text and, if you wish, images. Need further assistance in developing a recruitment plan or designing effective recruitment messages and study materials? Contact the CTSI Recruitment Center. These Microsoft Word templates are compatible with all versions of Word (Mac and PC). Select the template or templates you’d like to use, and click the “Download” button below the thumbnail image to download as a Microsoft Word file. 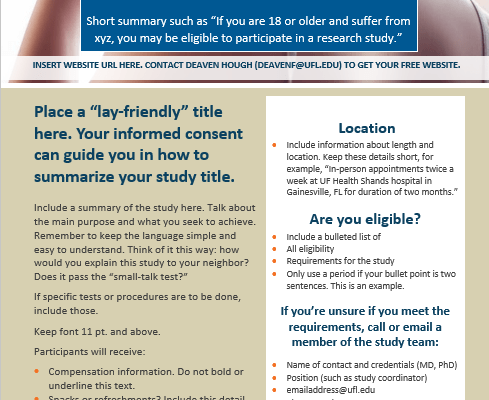 Replace the placeholder text and images along with your study’s information, following the instructions within the template. There is no need to move graphic elements or text boxes within the layout, change the colors, decrease the margins, or adjust the formatting. Save the Word document as a new file. 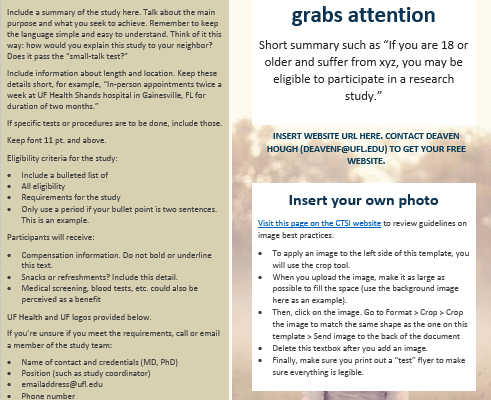 Submit the flyer with information about your study as part of your protocol to the IRB for review and approval. Questions or comments about the templates? We welcome your feedback! Please contact Deaven Hough, deavenf@ufl.edu.